I moved to California in January 2010. Chris convinced me to try living on a sailboat with him. "Just try it Annie. If you don't like it I promise we can live on land." 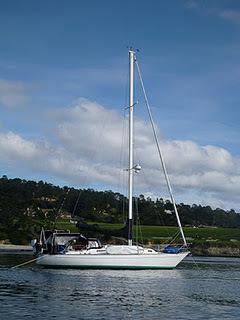 After our first weekend moored at Angel Island I was hooked. The freedom of moving your entire home using just the wind is pretty amazing! Chris thinks #3 will come first.....probably right. Well, that's the plan. We'll see what happens. Wherever we end, we're going to sell the boat there and then move back to Canada to start a family. As I write this, Chris is on deck finishing a boat project, I'd better go help. P.S. Check out our recent adventures photo gallery on the right to see pictures of us and the boat! Below are a couple pictures also.